The Dusk SMS Feedback SaaS product allows service providers to request feedback from their customers. A link is included in the SMS which allows customers to rate their service providers such as car mechanics, finance brokers, sales teams, real estate agents and many more customer facing roles. The real-time nature of SMS Feedback allows companies to receive massive volumes of customer feedback much quicker than with any other method. They are able to address customer concerns directly and quickly thereby increasing customer engagement. Thanks to SMS feedback, the business can create deeper relationship with their customers through automated communication with ROI realised very quickly. The SMS Feedback product is currently assisting companies in the financial, automotive, real estate and other sectors improve customer satisfaction, retention and input to their net promoter score, which translates to improved revenues. Personalized SMS messages allowing customers to provide feedback right through their mobile phones. A link is included in the SMS which allows customers to rate their service providers. 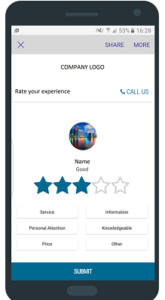 SMS Feedback includes a 5-star rating functionality, customisable buttons (service, information, personal attention, knowledgeable, price and other), personalised SMS and the ability for customers to request a call back to provide further feedback. SMS Feedback product is improving business process by making it more efficient as customer concerns are addressed directly and quickly. Also the service providers develop their skills, along with getting rewarded and recognised based on direct customer feedback.